What story should you tell in Facebook Timeline? Target audience: Nonprofits, foundations, NGOs, social enterprises, cause organizations, brands, businesses, Web publishers — anyone with a Facebook Page. 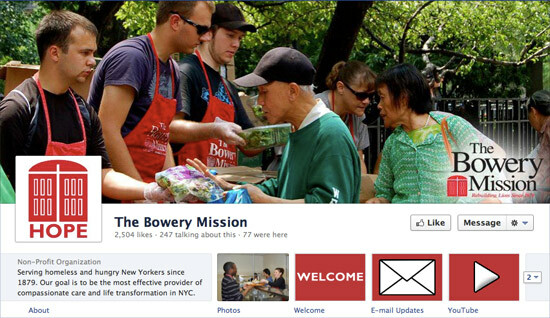 Editor’s note: Facebook is switching over all nonprofit and business pages to the new Timeline format on Friday, March 30. Because so many organizations haven’t yet made the move, or are still figuring out the best approach, we’re devoting this week to help you get ready to make the transition smartly. Contact Socialbrite if you need help. Pinterest Boards and Facebook Page Timelines have given you powerful new ways to tell stories through images. And while Pinterest has always been about images, the new Facebook Timelines have features that are nudging you to tell a more visual story. First of all, you can use cover images to create that first brand impression. Covers can (and should) be rotated so that you can tell your story in ways that are fresh and dynamic – like you! Highlighting allows you to create full-width updates on your page, which helps visitors avoid eyeball headaches when scrolling down your Timeline (here’s a tutorial on cleaning up your Timeline). 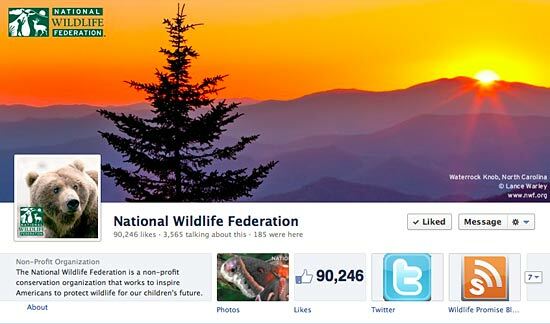 The new National Wildlife Federation page on Facebook. 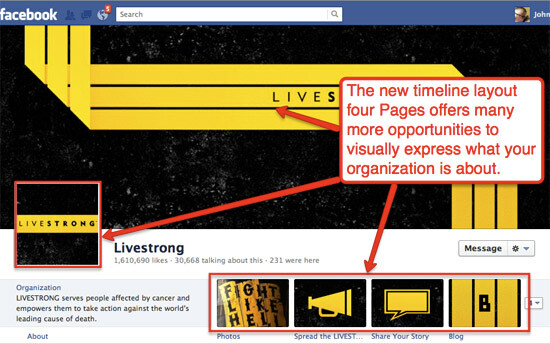 Like it or not, if you administer at least one Facebook Page, you’ll need to face the music Friday when the new Timeline format will go live on all nonprofit, brand and business pages. The thing is, we were comfortable with the old format. It allowed brands to set up default landing pages, so when a new visitor arrived at their pages, they would be prompted to first “like” that page in order to access discounts and other promotions. Companies loved this feature because it allowed them to convert visitors into fans without much work or paid advertising on their part. It’s not fun being made to get up out of a comfortable armchair, is it? Seventy percent of people polled on Sodahead voted against the new Timeline. Businesses have been so furious that they will not be given the option to keep the old page design that some threatened, in discussions on posts such as this one, to stop using Facebook entirely. But if you’re like most companies, deleting your Facebook Page isn’t really an option. The network has become so ubiquitous that customers have come to expect companies to have a Facebook presence. And with over 845 million active users on Facebook, most companies can’t afford not to be on Facebook. My friends at Hy.ly are dedicated to solving small business problems. 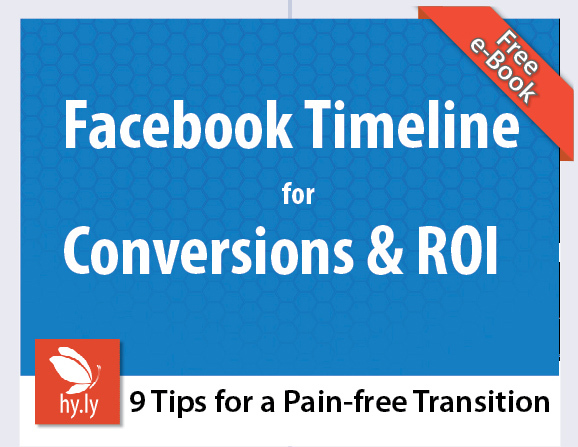 So they’ve just released a new eBook titled “Facebook Timeline for Conversions & ROI.” It’s free. I’ve had a look at it and I really like it (and tell me what you think of the design as well when you read it. I think it’s pretty nifty). 1Immediately after your Page is converted to the Timeline, you will probably notice a drop in traffic, especially if you were using default landing tabs. This is one of the most significant changes for brand pages, since landing tabs were a common social media marketing tactic. Target audience: Nonprofits, foundations, NGOs, social enterprises, cause organizations, brands, businesses, mobile app developers, Web publishers, educators, journalists, general public. Last month Facebook announced the release of more than 60 new Timeline apps that allow Facebook users to automatically share application actions on their Timeline. You may have first became aware of Timeline apps when all your friends were telling you what songs they were listening to on Spotify. How do Timeline apps work? Once you authorize an app, which only needs to be done once, a live connection is established with your Timeline. This means that as soon as you take an action with an app, like finishing a run with the RunKeeper app, the app automatically posts that action on your Timeline, as shown below. Frictionless sharing is Facebook’s new model for more digestible social sharing, both psychologically and technologically. In other words, Facebook has redefined sharing. Gestures that make sense – Facebook is now allowing app developers to use gestures other than “like” for news feed stories. In the example above, it says that I just “completed” a run with RunKeeper. (By the way, I can run further than .27 miles.) “Completed” works better because although I definitely completed the run, I may have not “liked” it. Permission hurdles removed – Timeline apps ask permission only once to access and share a user’s data. As shown below in the RunKeeper app, it’s easier for me to understand what the app needs to work. The app authorization also lists activities that will appear and allows me to choose who can see my activities.